On the theme of #FACEtheday balanceMe have released a few products to help us do just that. They kindly sent them to me to try out along with some delicious healthy snacks and tea. I’m a complete tea addict and have to say that my early morning cuppa is one of the only thing that helps me #FACEtheday – a Pulsin Chocolate Brownie always helps too (so tasty). Its aimed at smoothing pores, plumping fine lines and giving your skin that flawless finish. This is an incredibly lightweight product, and is light enough to use on top of your moisturiser. Its quite fluid but doesn’t feel oily or greasy. I like to use it under my makeup too because it gives such a nice finish to my foundation and my makeup applies so smoothly. I found this did give me that smooth, soft focus finish and even brightened my complexion. It was great at lessening the appearance of fine lines, especially on my forehead but I think in terms of seeing a lifting result this wasn’t instantly visible. I think this is a result that may happen over time and be a long term benefit of using this product. It gets my seal of approval but my only criticism is that I wish it was fragrance free because the scent is quite strong. If you struggle to look bright eyed and bushy tailed in the morning without applying half your makeup arsenal then I think you will love this simple but effective makeup skincare hybrid. 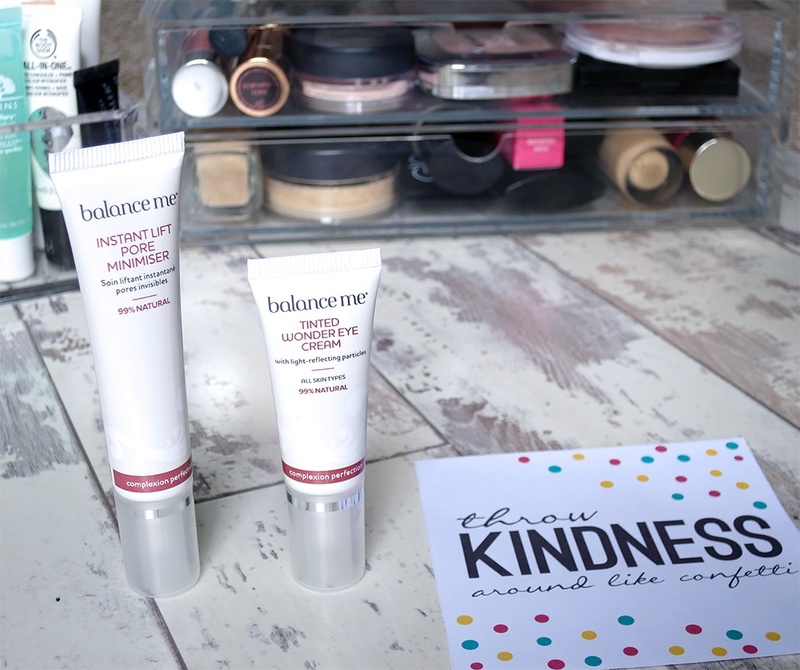 I have naturally dark under eye circles, so even when I want a makeup free day I still find that I have to apply a little concealer to that area just to add a touch or brightness so I was excited to learn that this Balance Me Eye Cream is tinted and offers not only coverage but also hydration and radiance. Its so easy to use and get noticeable results. Rosehip Oil: A powerful and vital skin antioxidant that encourages cell growth and renewal. Arctic Cloudberry Seed Extract: Rich in anti-oxidants and vitamin E this wonder-berry creates a barrier, protecting skin from environmental damage. A little product goes a long way and as I said on no makeup days this gives my under eyes enough coverage to look fresh and awake and much less dark. Its smoothing and lightweight, I have been using this religiously for a couple of weeks now. Even if I am not wearing a base (foundation, tinted moisturiser) I do like to wear a little concealer, just to cover a few blemish scars & make my dark circles look a little less dramatic. So here are my current concealers, I store them in a MUJI drawer & that fits them all in just perfectly. Seventeen Phwoarr Concealer – LOVE this, the quality is so good for an affordable full coverage concealer. I use this to conceal spots, imperfections and some redness on my nose & chin, I wouldn’t use it as an under eye concealer. Only because its a little heavy and tends to gather in my fine lines. I have to say it rivals my beloved Benefit Boiing the only thing separating them is that the Seventeen one is a little more creamy & at a push the Benefit one lasts slightly longer. Benefit Boiing – I have repurchased this so many times,This stuff covers imperfections like a hero! I’ve used it for years and can always rely on it to cover redness, blemishes and dark spots. It stays in place a heck of a long time, this stuff is heavy-duty. It’s a full coverage concealer but it doesn’t look heavy on the skin, you can blend it in so it looks even and not cakey at all. The formula is creamy and I find it works best if applied to the skin with your finger and blended out with a brush. A little goes a long way so start with a small amount and build up if you need too. Rimmel Wake Me Up Concealer – This only has a couple of uses left in it & I have enjoyed it but wouldn’t repurchase it. I used it as an under eye brightening concealer & think it did a good job of making my dark circles look brighter & my under eye area more awake. The reason I won’t be repurchasing is I found the product dried up quickly in the tube despite the lid being on very tight. Maybelline Age Rewind Eraser Dark Circle Brightening Illuminating Concealer Love this – it is that perfect combination of concealer and highlighter. I bought it whilst in America This is really hydrating, which I need and that means it doesn’t crease. It’s quite lightweight but still offers good coverage. It isn’t heavy duty coverage but if you’re looking for a light to medium coverage I recommend trying this. I took the sponge applicator off as I didn’t like it & thought it was quite unhygienic. Yves Rocher Radiant Youth Corrector Pen* – This is a clicker pen style concealer, which I like, I have the shade 1 which is a peachy pink colour and this works well to brighten and diffuse the darkness under my eyes. 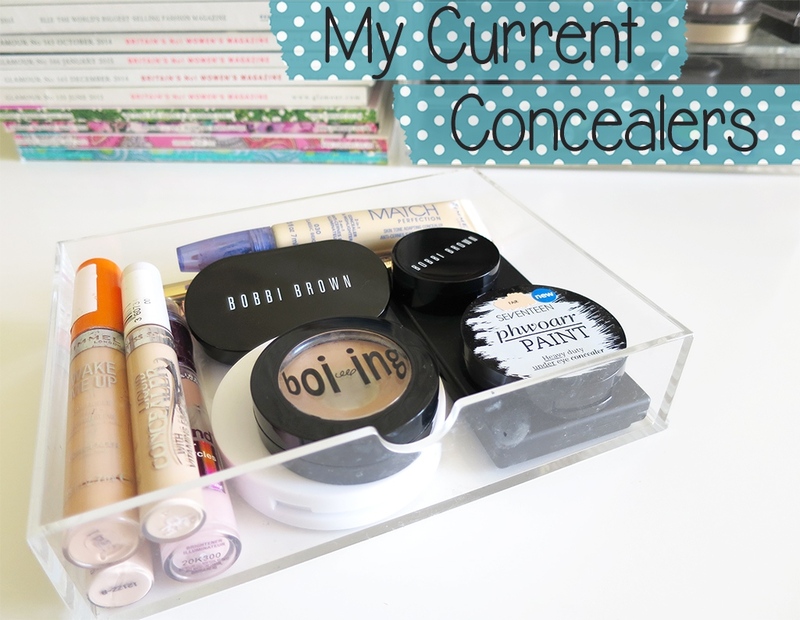 It is by no means a full coverage concealer and when my eyes look particularly dark I like to use my Bobbi Brown corrector as an extra step and use this on top for a little extra coverage. The formula is lovely and creamy and feels hydrating too. Bobbi Brown Concealer Kit – It took mw ages to get this to work for me, the product used to sink into my fine lines but if I make a real effort to hydrate my under eyes the product looks OK. It is a creamy concealer so it is going to crease a little throughout the day but combined with the Bobbi Brown Corrector (which I LOVE) they make a really good combo & make my under eyes look bright and healthy. I tend to use this more in the evening as its quite heavy coverage & it is expensive so I like to keep it for special occasions. Miss Sporty Liquid Concealer – This is a very budget friendly product, it is very creamy and hydrating, I have the shade Light & I use it under my eyes to brighten & make it appear that I’ve had 10 hours sleep. It does a pretty good job. I like it more than the Collection one (a lot more) as I find this blends better and is less drying. I have the shade 001 Light. Seventeen Stay Time 18 Hour Concealer – This is quite a blogger favourite & it was recommended to me so many times, I’m very glad I bought it as it is a very very good concealer for blemishes. It gives good coverage without being heavy or looking like you have tried to cover up imperfections. The staying power of this is up there with high end concealers. If you buy one product from this post make sure it is this one! Sheer Cover Conceal & Brighten Trio* £24.95 – I only really use the concealer shades in the trio and they’re good at counteracting dark under eyes and concealing flaws. I like to use them together and think they work much like the Bobbi Brown kit. They’re not as creamy as the Bobbi Brown ones but they are easy to blend and they don’t dry out the area. I think this kit is a little pricey but it is handy to travel with as it has a decent mirror & its perfect for having in your handbag to reapply / touch up on the go. Rimmel Match Perfection Illuminating Concealer – This is good for brightening the under eye area, its not the best at covering blemishes or imperfections (as it does have an illuminating quality to it). It is quite creamy but looks fresh and bright and if you use a lightweight powder over the top it stays in place nicely all day. Sleek MakeUp Corrector & Concealing Palette – This doesn’t get as much love from me as it deserves, I think thats because I have an abundance of similar concealers. I think when I have used up a couple of the others I will use this more. You get a peachy correcting shade, a concealer shade & a yellow toned powder (good for highlighting and keeping concealer in place). This is really well packaged in a slim sturdy palette with a nice sized mirror. I might take this with me next time I travel. Oh & this also has SPF15 in which is unusual for concealers.